Your RV is a means to embark on adventurous travels on the open roads of America. For some of us, being able to hop on our motorcycle to see the scenic sights makes for an an amazing and memorable journey. Here at RVupgrades we understand bringing your bike with your while you travel can be tough without the proper equipment, and the thought of leaving your motorcycle at home can be frustrating. This is why we offer RV accessories perfect for the motorhome and motorcycle aficionado. This month we are featuring the Blue Ox Motorcycle Carrier. A sturdy motorcycle carrier capable of being installed on to your motorhome quickly and easily, which is a big plus when it comes to the thought of bringing your bike along on the adventure. This unique carrier allows you to bring your bike along for the journey and still have the ability to tow a vehicle with a tow bar. This is accomplished by welding the two included receivers to the frame of your motorhome and using the included receiver extension in your 2" receiver hitch. Blue Ox powder-coats the carrier effectively preventing rust and corrosion. The durable frame construction is guaranteed to not interfere with vehicle towing equipment and will fit most motorcycles due to the fully adjustable tire stop. The Blue Ox Motorcycle Carrier I weighs approximately 130 lbs and is easily removed if the need should arise. The included tie down brackets and six inch wide tire rail will ensure your bike's safe and stable transport. Since the weight limit exceeds 900 lbs, you should have no trouble towing a cruiser-style or sport motorcycle. 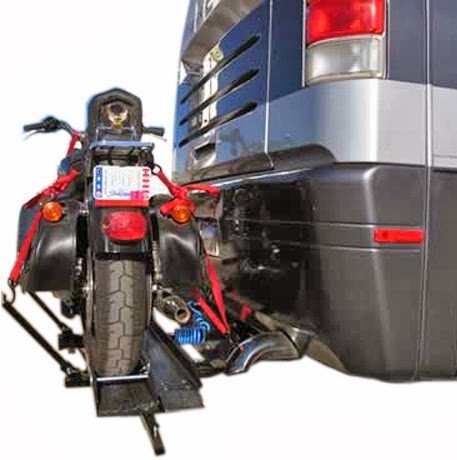 For more information on the Blue Ox Motorcycle Carrier or other RV accessories, please visit RV Upgrades.com. We proudly provide RV owners with the highest quality products and service for all your motorhome needs.